♥ Note the slightly longer delivery if you order more jewelery you receive everything with longer delivery time. ♥ The charm is real silver and can be attached to each piece of jewelry from the collection. ♥ The hand engraved in our workshop with a marking pin. ♥ We engrave the traditional way by hand in our workshop. This happened with a marking pin. which we can write by high pressure. So the engraving is not "mechanically straight 'but literally' hand-written 'by Tanja. ♥ The heart is approximately 11 mm wide and 12 mm high (without ring), nice buddy for bracelet or necklace. ♥ You can choose whether you want the charm on the clasp of a bracelet, in the middle of a bracelet, or would have done separately. Make her jewelery additional personal with a through-and-through silver charm. On the front we engrave a name, date or word choice. At the back there are many beautiful texts (or a letter) to choose from. 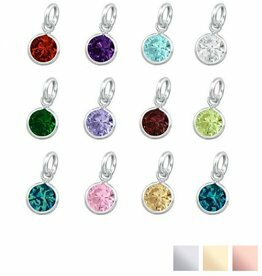 Beautiful birthstone charm made of SWAROVSKI® ELEMENTS crystal and .925 silver. Each date of birth has its own birthstone, where you can make the piece even more personal.